We have compiled a list of the best books for lawn care and landscape business owners. We only included books we have actually read, so please feel free to let us know if we missed a good one! At Lawn Crack, we truly believe a large portion of our success can be attributed to the knowledge we have accumulated by reading these books and many more. We consider some of these authors as our personal mentors. They have impacted our lives in a very positive way through their books and other forms of content they produce. We hope you find these books just as valuable as we did and are confident you will. It is so important to continue to educate yourself throughout life. Listening to books while you are driving, at the gym, or are out in the field is a great way to improve yourself and not add any time to your day. We know you are busy! We are too. This information contained in these books could forever change your life. We know they have changed ours. I literally wrote the book on how I went from broke with a push mower to $100k plus with my lawn care business. I was lucky and learned from a local business that was kind enough to share with me everything I needed to know as I worked for them for 3 years before starting my business. I know a lot of people don’t have that luxury. That is why I wrote the book. 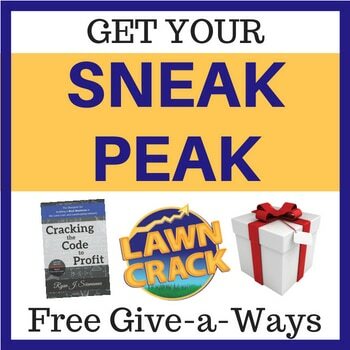 I don’t believe there is a book anywhere in the world that goes into the detail I do on how to build a profitable lawn care business from scratch without any money. I have read every other book like this I could get my hands on, including Jonathan Potoschink’s book, which I thoroughly enjoyed and found extremely valuable. It was very hard to determine what order to list these books! We did our best to put them in the order we would read them if we had not read them already. You can get a free Audible or Kindle trial by clicking our links or click on the image of any book to purchase it on Amazon. We hope you enjoy our list of the best books for lawn care and landscape business owners! For more tools that we have used to improve our lawn care businesses please check out our resources page. Are you subbed to LawnCrack on YouTube yet? Join the fasted growing Lawn and Landscape Channel YouTube has to offer! Well, recommended by Joe Konold! Joe was kind enough to share a book he felt was missing from this compilation of books for business owners by filling out the form at the bottom of this page. If you know of a book that is missing…please share! Jocko and Leif share their experience as Navy SEALS and how it relates to life and business. I can only imagine how powerful this book will be. Can’t wait to consume this knowledge! Hands down this book was the most influential to me in regards to building a business that operated like a business. I cannot recommend this book enough! I consider it a must read for any small business owner. Start working ‘on’ your business, instead of ‘in’ your business. I can guarantee you will not build a business without having to deal with people! You will have customers, vendors, and employees that you will be communicating with on a daily basis. Learn the principles in this book to get the most out of your relationships. We are huge Grant Cardone fans. Grant tells it how it is and does not sugar coat anything! If you want an uber-successful businessman to give it to you straight, this book is for you. Whatever you think it will take to be successful in your business…multiple it by 10 and you will be on the path to success. Josh Kaufman is wise beyond his years. This book will break business down for you. After reading it you will have a better understanding of how businesses operate and make money. I re-read this book every year or two because it contains so much information I want to make sure I am not forgetting anything. Mike Michalowicz is quickly positioning himself as an authority in the business world. The Pumpkin Plan was the topic of one of our Podcasts and rightfully so. It is all about improving your business by focusing on what is working and dropping what is not. You have to focus if in business to stay ahead of the pack. Tim Ferris is a beast! Open your eyes to the possibilities in the world. Tim describes time as a currency in this book and I cannot agree more. What good is it to accumulate a bunch of money if you never have the time to enjoy it? Tim discusses topics you may have never considered in this book. Highly recommended. Need a website for your lawn care business? Another book by Mike Michalowicz. Profit First descibes an accounting method in which you pay yourself first. It is such a good idea. Of course, you need to have a business that operates like a business to make this happen. 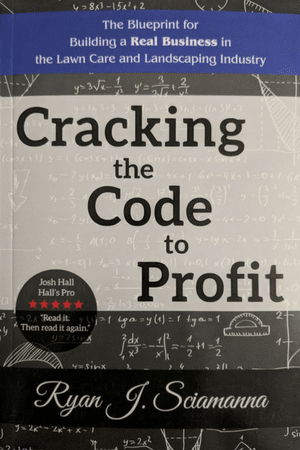 But the principles contained in this book will change the way you look at money in your business. Traction is another great book on organizing your business to operate like a business and create profit for the owner(s). Solid, timeless principles are sprinkled all throughout this book. I would highly recommend this book for ideas on how to take your business to the next level. Jim Collins is well respected for a reason. This book is a classic business book. He talks about getting the right people on your bus. What he means is that you need to get the right employees in the right positions in your company. If you have the pleasure of employing people, this is a must-read. My personal favorite book! This is one to read instead of listen to. Contained within the pages of this classic by Napoleon Hill is the secret to success. That is not a joke. It will require action on your part, but nonetheless, if you follow the principles success will be yours to keep. Love him or hate him, Robert Kiyosaki knows a little bit about money. I have found value in all of the Rich Dad series books I have read so far, roughly 8, but you should start with this one. Go back to school with a little financial education from a super successful entrepreneur. It is actually not a secret at all. That is the strangest part. And it is actually not even a book. It is a recording of Earl Nightingale’s speech. It states the people simply do not think. I agree with his meaning of that statement. This is a great quick listen that will leave you motivated and ready to strive for those goals! Still just want to listen to music? We get burnt out on audio books from time to time too! Have you tried Amazon Music Unlimited? It has just about any song you could think of and is available anytime right on your phone. This is our go to when we need to take a quick break from reading. 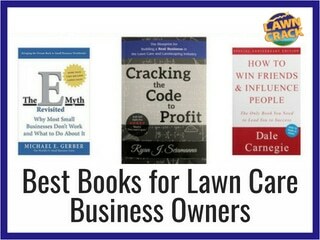 Did you enjoy our selection of best books for lawn care and landscape business owners? Is there a book you feel we missed? This is definitely not a complete list of all the books that have influenced us. We will be adding to this page over time. Please feel free to let us know what books you feel others would benefit from so we can get them on here ASAP! Submit a Book we Missed!